A recital of masterworks of Frédéric Chopin (1810-1849) featuring the Sonata No. 2 in B-flat minor, Op. 35; Sonata No. 3 in B minor, Op. 58; Ballade No. 4 in F minor, Op. 52; Fantasy in F minor, Op. 49, and the Barcarolle in F-sharp major, Op. 60. 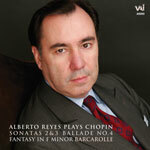 Click here to watch Alberto Reyes play the first movement of Chopin's Sonata in B minor, Op 58 taped during the recording sessions for this CD set. minutes). Website www.vaimusic.com. Producer/Engineer Richard Price. remarkably original interpretations need no justification. repertoire on a DVD of his 1964 Moscow Conservatory concert. intensely personal, deeply felt music-making and élan vital. "His performances of the two mature sonatas, fourth ballade, Barcarolle and Fantasy are deeply personal, imaginative, straight from the heart, and reminiscent of the grand manner of a bygone era"
"...playing of unusual distinction. Alberto Reyes does not seek to dazzle with his Chopin, instead treating the ears to rich, deliberate and supremely lyrical playing"